The latest NATS Winter Workshop wrapped up in beautiful West Palm Beach, Florida. Our local coordinator, Lloyd Mims, welcomed us warmly and we truly enjoyed our venue, the recital hall at Palm Beach Atlantic University. The latest NATS Winter Workshop wrapped up in beautiful West Palm Beach, Florida, a week ago as of this writing. Our local coordinator, Lloyd Mims, welcomed us warmly and we truly enjoyed our venue. The recital hall at Palm Beach Atlantic University was stunning. Local pianist Bob Sharon played everything put in front of him with ease, and even provided a “how to take care of your accompanist” guide to take with us. Frank Ragsdale started the workshop with two fabulous sessions, one geared toward finding music theater repertoire for the crossover singer (including online resources), and one session geared toward coaching it. 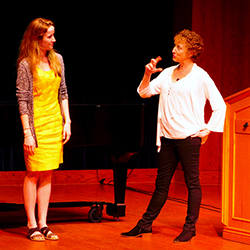 Helen Tintes-Schuermann led us through the operetta repertoire, and gave a wonderful master class on the subject. Our second day began with returning NATS clinician, dancer-turned-osteopath Jennie Morton. Her sessions on the workings of the body as applied to performing artists were packed with information and enthusiastically received. She topped off her presentations with a fantastic master class. Long time European residents and former faculty members at the Vienna Conservatory Michael Pinkerton gave several sessions both singly and jointly. Mock auditions, both with opera and music theater needs in Europe mind, were balanced with an informative session on how to study, work, and live in Europe as a young singer. The weekend concluded with a brief history of the zarzuela with Janelle DeStefano, who also sang gorgeously in one of the master classes. Her own master class on the zarzuela repertoire opened our ears to diction nuances as well as stylistic and expressive norms in the genre. Throughout the workshop, NATS Executive Director Allen Henderson and NATS President Karen Brunssen were present, offering assistance when needed and getting to know the people who attended. Regional Governor Marcia Porter was also on hand, helping at the registration table and offering a welcome from the region. It was great to have them all with us. Registrants were served by a trolley that ran from the hotel to the venue, courtesy of the fabulous Debbie Guess in the NATS National Office. As always, I am deeply grateful to Debbie, Margie, Tina, Paul, and Allen in the national office, without whom none of this would be possible. Connie and Tripper from EGAMI video recorded all of the sessions with their usual expertise and ease, along with the staff at PBAU, who were also very helpful. Recordings of the sessions will be available for those who were unable to attend. It takes many hands to make this workshop happen, and I’m grateful to each and every one of them for their help as well as their kindness. It is truly a bunch of terrific people! I offer them another hearty thanks for their team spirit.